Welcome to Namaste News, where you can stay up to date with all the latest developments and news from Namaste. See below for all the latest updates. If you would like to receive a regular monthly news update from Namaste to your inbox, please go to Contact Us and tick the appropriate box on the enquiry form. The Namaste Global Expedition Europe & Middle East Plan is now available. Check it out now to find out where and when you can join between January and March 2006. The expedition returns to London on 1/2 April 2006 at the end of the 2-year Part I - keep the weekend free to celebrate! The Namaste Global Expedition passes the 60,000 mile mark in Timbuktoo, on the edge of the great Sahara desert in Mali, after 569 days on the road. The Expedition explores the remote Air Mountains and Tenere Desert of Niger on a 580 mile round trip from Agadez. The Expedition completes a ground-breaking traverse of Central Africa – through Southern Sudan and the Central African Republic – the first visitors to the region in 22 years (see September News for more details). The Expedition visits the world famous gorillas and chimpanzees in the remote border region of Uganda, Rwanda and the Democratic Republic of Congo. The August 2005 Namaste Kilimanjaro Expedition Report is now available. Click Here to download it now. The Expedition reaches the source of the Nile in Uganda after recovering from broken shock absorbers in the deserts of northern Kenya. Success on Kilimanjaro. 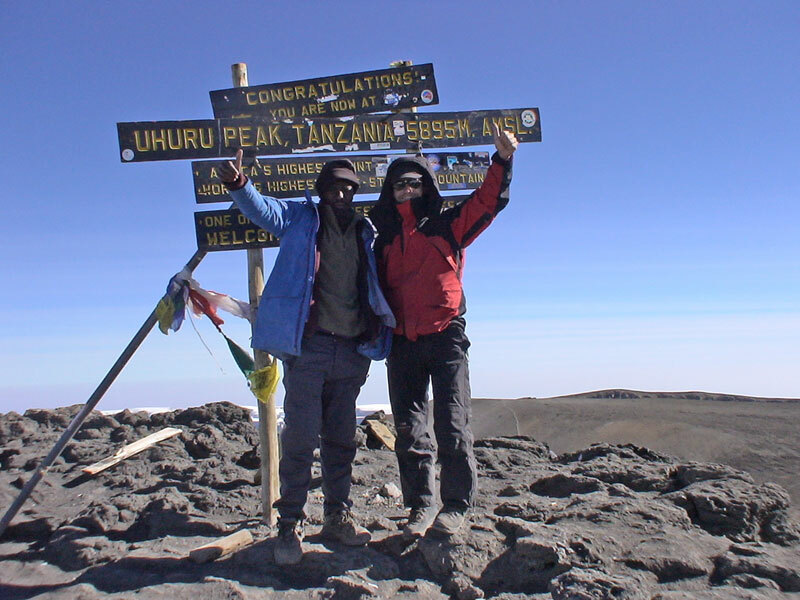 Chris & Naiman reached the summit of Uhuru Peak at 5,896m at 8:30am, Click Here to see the photo. Packed full of features, the July 2005 Namaste News is now available… Including features on Jo’s Roadtrip, scuba-diving in Mozambique, and the Kruger National Park; plus Teaching with VSO in Namibia, Lake Nyasa and the latest update from the Global Expedition, Click Here to download it now. The Namaste Global Expedition Africa Plan has been updated. Click Here to download the latest version. The Namaste Global Expedition passes the 10,000 mile mark across Africa reaching Dar es Salaam in Tanzania (54,000 miles overall). The Namaste Global Expedition reaches the 50,000 mile mark on the coast of Mozambique near Vilanculo after 465 days through 25 countries. Packed full of features, the June 2005 Namaste News is now available… Including features on SW Africa Wildlife, the Namib Desert, Okavango Delta and Victoria Falls; and the latest update from the Global Expedition, Click Here to download it now. Packed full of features the May 2005 Namaste News is now available including features on Cape Town, Shark-cage diving, and tracking black rhino; plus the latest update from the Global Expedition, Click Here to download it now. After some shipping delays, the Namaste Global Expedition begins the trans-Africa leg with a visit to Cape Agulhas, Africa’s southernmost point. Click Here to download the latest Africa plan. Namaste Global Expedition to feature in a supplement to the UK's Independent newspaper on Saturday 28th May 2005. Namaste Management Case Studies now available. Click Here to view. 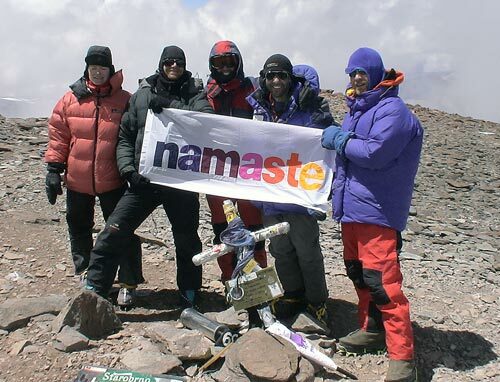 Packed full of features, the April 2005 Namaste News is now available. Including features on Rio de Janeiro, the Iguacu Falls, and wildlife of the Pantenal in Brazil; plus the latest update from the Global Expedition, Click Here to download it now. After 380 days & 42,000 miles, the Namaste Global Expedition completes the circumnavigation of the Americas . Next, the Expedition heads for Africa. Click Here to download the Africa plan. The Namaste Global Expedition features on X-Perience Tour on FOX SPORTS TV in the Americas. Show starts at 5pm Argentina time on Saturday 9 April and 10am Argentina time on Sunday 10 April. After 351 days & 35,985 miles, the Namaste Global Expedition reached the ‘end of the world’ at Ushuaia on the island of Tierra del Fuego, the southernmost tip of South America. Namaste Aconcagua Expedition Team arrives safely at Base Camp, Plaza de Mulas, at 4345m. The Namaste Aconcagua Expedition kicked off with the arrival of the team in Santiago, Chile. The team will be climbing South America’s biggest mountain at 6962m. Click Here to see the Aconcagua plan. The Namaste Global Expedition in South America is now full; and places are being reserved for sections of Africa (starting on 15 May), so book yours early to guarantee an adventure of a lifetime... The detailed Africa plan will be available from 1 March 2005. The Namaste Global Expedition reached the 30,000 mile mark in Bahia Inglesa, Chile after 289 days. The Expedition features in the February issue of Land Rover Owner International Magazine (p60-65). Available from today. Packed full of features, the December 2004 Namaste News is now available... Click Here to read the latest update from the Global Expedition, including features on the Andes, Lake Titicaca, the Inca Empire and Macchu Picchu. The Expedition sees in the New Year at the chilled Bolivian resort of Copacabana on the shores of Lake Titicaca... Click Here to find out how to join. The Expedition makes a successful ascent of chachani, 6075m, near Arequipa, Peru. Join the Global Expedition for a Christmas & New Year Party in Peru – space now available… Click Here to find out how to join. The Global Expedition successfully reaches the South American continent, shipping the vehicle from Panama to Ecuador. Namaste Global Expedition Media Pack now available. Click Here to download. Packed full of features, the October 2004 Namaste News is now available. The Aconcagua Expedition in Feb 2005 is now full. The team includes people from the UK, Norway and Argentina. Spaces remain available for a number of other 7 summits. The Namaste Global Expeditioners watch the eruptions of Costa Rica’s most active volcano, Volcan Arenal. One space has become available on the Namaste Aconcagua Expedition in February 2005. Participants will arrive in Santiago, Chile, on 31 January and return to Santiago on 20 February. For more info, Click Here. If you would like to join, Click Here to contact us now. The Expedition completes the North America leg, covering a total of 19,820 miles in 173 days through Canada , the USA and Mexico. The Expedition appears in the Guadalajara Reporter, Mexico. The Namaste Global Expedition reaches Mazatlan in Mexico. Space is now available for Mexico in September. Central America is almost full; and South America is filling fast, so reserve your place early. The August 2004 Namaste News (pdf - 960 KB) is now available. Availability for the Namaste Global Expedition has been updated. Click Here to view the North America Plan (pdf - 960 KB) and Click Here to view the Central & South America Plan (pdf - 0.99 MB). The Namaste competition officially closed today. Congratulations to Lotta Pohjola from Finland, who wins a £1,000 holiday on the Namaste Global Expedition (pdf - 248 KB). See the August 2004 Namaste News (pdf - 601 KB) for full results. Also, keep an eye out here for future competitions.or subscribe to Namaste News so you don't miss out. After 15,700 miles, the Namaste Global Expedition reaches the Mexico border at Tijuana. Time for Chris, the Expedition Guide, to start learning Spanish. After a national park extravaganza during July in the US, the expedition reaches the Pacific coast in San Francisco. The North America Plan (pdf - 961 KB) and the Central & South America Plan (pdf - 1,021 KB) are now available. Review these documents to see the route and timings for the Namaste Global Expedition. Website updated including new Namaste Fun Past Adventures: African Safari (pdf - 2 MB), Mountain Biking (pdf - 2 MB), Sailing & Waterskiing (pdf - 980 KB), Kayaking & Rafting (pdf - 915 KB), Flying & Paragliding (pdf - 683 KB), Eco Challenge (pdf - 837 KB) and the Marathon des Sables (pdf - 371 KB). For an overview of all Past Adventures, Click Here (pdf - 614 KB). Click Here for the June 2004 Namaste News (pdf - 526 KB). The Expedition reaches Long Beach on the Pacific coast of Vancouver Island, completing a 10,220 mile journey East to West across Canada, including Alaska. The Namaste Global Expedition is now open to anyone. Covering no more than your own costs, Click Here to find out how you can join the expedition (pdf - 330 KB) or go to the Expedition page to find out more. The Expedition reaches Prince Rupert in British Columbia after 4 days sailing down the Marine Highway in Alaska’s Panhandle, including some fantastic whale watching to. See the June 2004 News (pdf - 526 KB) for more info. Chris appears on CBC Radio to talk about the Global Expedition, and gives an update to the Yukon News. Download the May 2004 (pdf - 499 KB). edition of Namaste News here. The competition is still open for your chance to win £1,000. Click Here to view pdf (pdf - 499 KB). New Global Expedition information available. Read the Expedition Introduction (pdf - 248 KB), the Expedition Vehicle (pdf - 361 KB), and About the Expedition Guide (pdf - 255 KB). The Namaste Global Expedition crosses the US-Canadian border along the "Top of the World Highway". The expedition is now open to all, so go to the Global Expedition page to find out more. Read about Namaste Past Adventures. 2 new pdf's available: Scuba-diving (pdf - 1.5 MB) and Overland Touring (pdf - 3 MB). Joey, an American mountain guide, gets a ride in the Expedition Land Rover from Talkeetna to Denali National Park. Mt Vinson and the Antarctica leg of the expedition have been postponed. Originally planned for December 2004, this leg will be completed in December 2005 in order to allow more time in northern South America. Chris returns from Denali. Read the Expedition Report by Clicking Here (pdf - 674 KB). Chris sets out on the first of the 7 summits (pdf - 934 KB), Denali in Alaska. Subject to weather conditions, the climb should take about 3 weeks. First edition (April 2004) of Namaste News is now available. Click Here to view pdf (pdf - 330 KB). See here for details about the competition you can enter to win £1,000 on the Namaste Global Expedition. Namaste website updated. New pdf documents now available include: Trekking & Climbing (pdf - 2 MB) and Mountaineering (pdf - 2 MB). The Yukon News writes about the Expedition story. Click Here for the article (pdf - 630 KB). Keitha writes about her experiences during the first week of the Namaste Global Expedition. Click Here to view pdf (pdf - 190 KB). Namaste website updated. New pdf documents now available include: About Chris Charlton (pdf - 502 KB), Project Process Chart (pdf - 330 KB) and Namaste Global Expedition (pdf - 674 KB). Keitha Clark, freelance Canadian journalist, becomes the first person to join the Namaste Global Expedition. Namaste Global Expedition makes the evening news on CBC, hosted by Linda Kelly, on the eve of commencing the first leg of the expedition across Canada. Chris Charlton, founder and managing director of Namaste, sets off on an amazing 3-4 year global adventure in a state of the art expedition vehicle. See press release (pdf - 674 KB) for further info. Namaste Management successfully completes a major Projects assignment. Leading an alliance of 7 companies in conjunction with a major client, WS Atkins, Namaste Management delivers (on time, under budget and to quality) a concept design for a conditioned waste store for the UK Atomic Energy Authority. State of the art Namaste Global Expedition vehicle ready to go. Can't read PDFs? Click Here to download Adobe Acrobat Reader .